Recently I received a question on how to create a custom fenestration element in SANSCalc Online to be used as a windows type. A need to create your own custom component will arise if you want to use specific supplier’s windows and doors. The supplier need to have its windows and doors products tested by CSIR and a U-and Solar Heat Gain values needed to be assigned to the particular fenestration item. 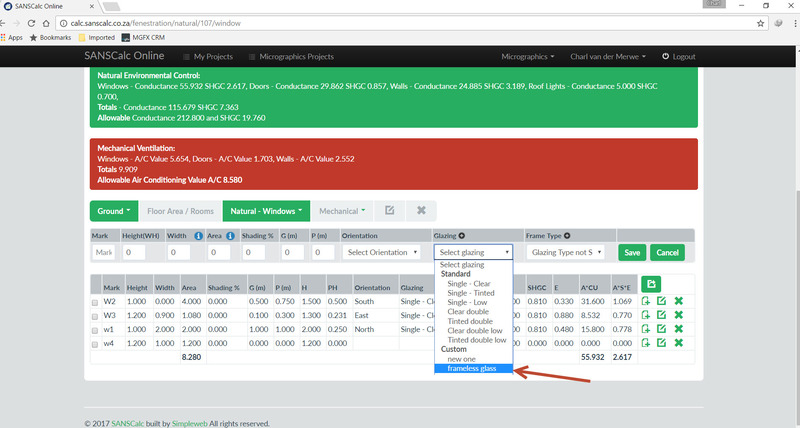 Using this information, you can add this custom item into SANSCalc Online and use it to assign U and SHGC values to the glazing and frame types of a particular window or door. The workflow will then be to firstly create both the glazing type and frame type individually. Thereafter assemble both the custom glazing item and custom frame item into one fenestration component. Follow these steps to create the custom component. Log on to SANSCalc Online at http://calc.sanscalc.co.za/user/login. Open your project and go to the Natural Fenestration module of the project. 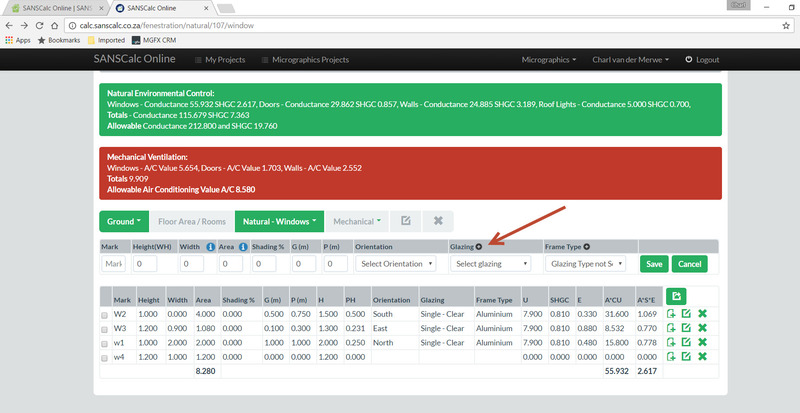 Now click on the add custom glazing button as shown below. Now name the new Glazing item for instance: Frameless Glass. Click Save. At the top menu click Custom Frame Type and add a frame component. Name it : Frameless frame. Click Save. Now that you have created both the Frame and the glass item you can assemble them together into one fenestration item. On the menu above click on the Custom Component Tab. Click Add new component. Select your glazing and frame types and add the U- and Solar Heat Gain values. This custom component can now be used as a fenestration glazing and frame type in the fenestration module. See below.